The bottom row now displays alternating messages. When the next train is more then 1 minute out (and in explore mode): "Report anything suspicious", alternating with "Keep your belongings with you". 1 minute before the next departure, the alternating message is "Train approaching". When the train is at the platform, the alternating message is "Let people off the train first". Nice work, really shows the progress in the sim! Can't wait to try this map! 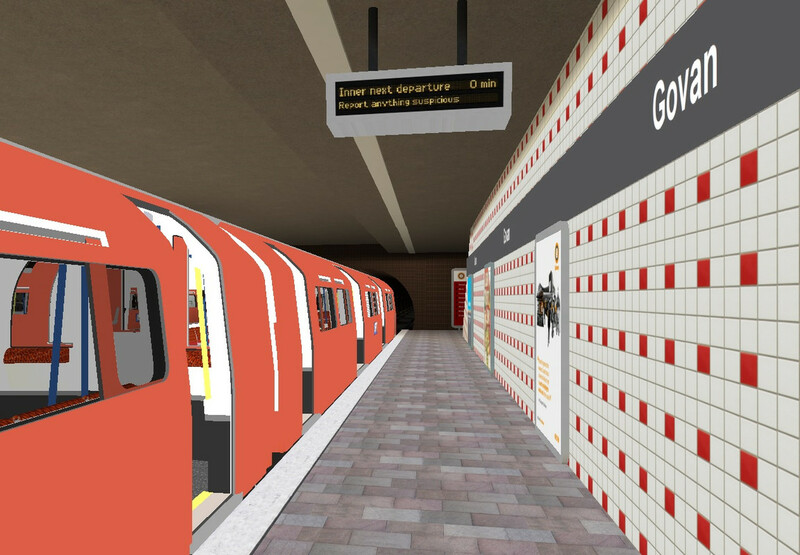 If you're making one in London, could you make the "Mind the Gap" announcements when the train is at a curved station and "Stand clear of the doors" when closing its doors? He's not making a London map but a Glasgow one. Perhaps adding this closed station in the map, like s' Gravendijk, until 2018? Last edited by Alfacinha315 on 24 Mar 2018, 13:18, edited 1 time in total. It's located between Partick and Govan. Just outside Partick, as this station replaces Merkland Street. Don't worry; I did not forget about it . I actually included it in the video on youtube, but the tool I used to edit it, Camtasia Studio, proved to be total crap . On the "underground song" part of the video, it blacked out the Merkland Street scene (of a train passing trough it), and when the entire video was made, it started blacking out everything after just the first few seconds. A bit of research resulted in many complaints on different websites about this issue, and nobody (even the producers of the program) offering a working solution. In the background (tunnel on the right) you can just see Partick. Last edited by Sjoerd on 24 Mar 2018, 13:36, edited 2 times in total. As you can see on the top of the page; the DRIM panels are already finished. Yes, I know on your photo it says "next arrival" (I have seen it earlier), but I decided "next departure" is just better; when it comes to people who enter a station to go somewhere else (and not pick other people up), the next arriving time is a pretty useless bit of information; you do not want to know when the train arrives, but when it departs. And if the train is already at the platform, "next arrival" could only apply on the next train, not on this one . So that's why my panels say "next departure"